Saorview is Ireland’s national DTT service. The Irish word Saor means free, thereby mirroring a common name of DTT services in many regions, Freeview, through a mix of the English and Irish languages. Saorview is available from 64 DTT transmitters covering 98% of the population as of the end of Q3 2012. The service is a DVB-T/MPEG-4 HD broadcast that is received via set top box (STB) receiver or iDTV and UHF aerial is required. MHEG-5 is the middleware standard for digital teletext. Programme information is displayed through the receiver’s own inbuilt EPG. Either DVB or Teletext subtitling can be displayed when broadcast. A DVB-T/MPEG-4 HD set top box (STB) receiver or iDTV and UHF aerial will be required. MHEG-5 has been selected as the middleware standard for digital teletext, Saorview branded EPG and interactive services. For non MHEG-5 compatible receivers regular analogue TV teletext will continue to be available and programme information will be displayed through the receiver’s own inbuilt EPG. Either DVB or Teletext subtitling can be displayed when broadcast. On 20 January 2016 RTÉ announced that it had partnered with Freesat, the UK free-to-air television company, to develop a new product for Saorview, Ireland’s free digital television service and the largest television platform in Ireland. This follows a previously announced intention to develop a new hybrid offering for Saorview The Saorview Connect offering will allow customers to connect a new type of receiver to their home broadband. The service will feature advanced functionality including online services, a backwards EPG, access to content recommendations, a newly designed remote control and a mobile app. Viewers in the Northern Ireland can receive a number of channels broadcast in the Republic of Ireland, including TG4 and RTÉ One RTÉ Two, TG4 and RTÉ Raidio na Gaeltachta. The multiplex (NiMux) broadcasts in DVB-T2, the same parameters used by Freeview HD and is available to 90% of viewers in Northern Ireland. 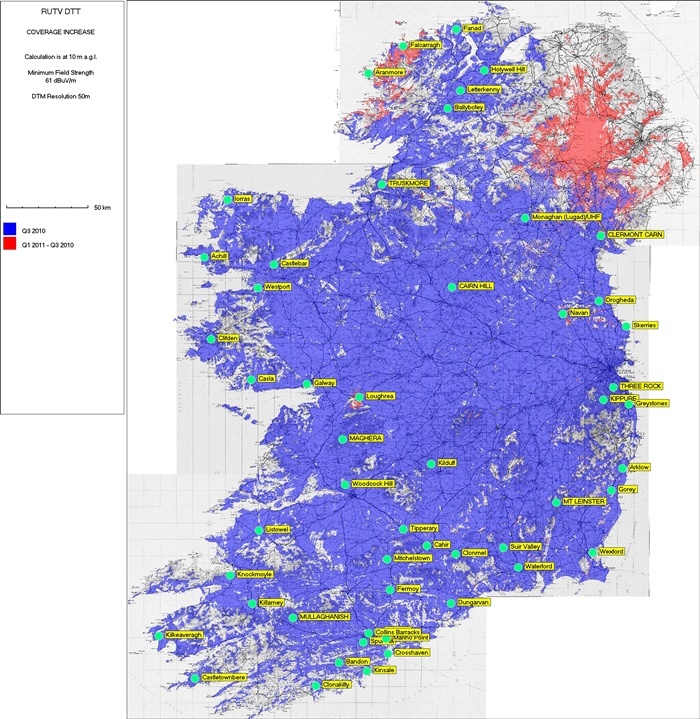 Other areas are covered by overspill from the Irish Republic and by Saorsat which covers almost the whole of Ireland. 2rn operates two DVB-T PSB multiplexes for transmission of Saorview television and radio channels. Both multiplexes are free-to-air, and feature MPEG-4 encoding. RTÉ2 HD 2 1440 x 1080i 192 kbps General entertainment. TV3 Ireland 3 544 x 576i 192 kbps Joint Stereo General entertainment. TG4 4 544 x 576i 192 kbps Joint Stereo Gaelic language channel. 3e 5 544 x 576i 192 kbps Joint Stereo General entertainment. RTÉ News Now 21 544 x 576i 192 kbps Joint Stereo News Channel. Oireachtas TV 22 544 x 576i 192 kbps Joint Stereo Oireachtas and European Parliament proceedings. Saorview Information 23 544 x 576i 160 kbps Joint Stereo Saorview Information. RTÉ Radio 1 200 N/A 128 kbps Joint Stereo Mixed music, news & speech. RTÉ Radio 1 Extra 201 N/A 128 kbps Joint Stereo Intelligent speech. RTÉ 2fm 202 N/A 128 kbps Joint Stereo Popular music programming aimed at a young audience. RTÉ Lyric fm 203 N/A 160 kbps Joint Stereo Classical Music. RTÉ Raidió na Gaeltachta 204 N/A 128 kbps Joint Stereo Programmes and music in Gaelic. RTÉ Pulse 205 N/A 112 kbps Joint Stereo Electronic Dance Music. RTÉ 2XM 206 N/A 112 kbps Joint Stereo Focuses on alternative and indie music. RTÉjr Radio 207 N/A 112 kbps Joint Stereo Children’s radio station. Shared bandwidth (0700-2100). RTÉ Chill 207 N/A 112 kbps Joint Stereo Chillout and ambient music. Shared bandwidth (2100-0700). RTÉ Gold 208 N/A 112 kbps Joint Stereo Golden oldies station. Channels with no LCN are test services which are not be visible on many receivers. There are also a large number of blank audio and data channels (again invisible on most receivers) which are presumably reserved for future services. RTÉ One HD 1 1440 x 1080i 192 kbps General entertainment. be3 6 544 x 576i 192 kbps Joint Stereo General entertainment. Test service no LCN 1440 x 1080i 192 kbps Joint Stereo AG Tástáil Innealtóireachta. HD Images from Dublin and Galway plus mountain scenery. Test service no LCN 544 x 576i N/A N/A RTENL “Tástáil Innealtóireachta” Test Card (captions “2RN” and “Eireann”).